I had the good fortune to hear Richard van Emden give a talk a few years ago on the subject of another of his books, ‘Boy Soldiers’. His talk was as engaging as the book, and he clearly has a knack for picking out lesser-explored areas of the war and presenting them in an interesting and informative way. In recent years there has been a plethora of books on the soldiers’ experience and recollections. But what of the families they left behind when they joined up, and how did they cope with the temporary, or in many cases permanent, loss of a father or husband? 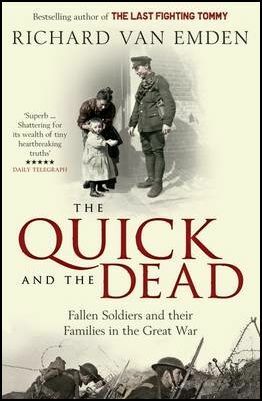 In “The Quick and the Dead”, van Emden deals with these issues in a sensitive yet thorough manner. Given the emotive subject of this book, I defy anyone not to be moved by the stories he relates; one can almost tangibly feel the pain and grief many of the families went through upon hearing of the death of a loved one. The book traces the families’ journey, from the moment their husband or son was called up, how they coped both emotionally and financially at home, to how they dreaded and then dealt with the news that their loved one was missing or killed. A host of subjects are covered, including the use of mediums by some desperate, grieving families; unscrupulous characters who charged relatives for supposed ‘leads’ on a missing soldier’s whereabouts; the controversial issue of the exhumation of the dead and how it was handled by the then IWGC; the construction/erection of the Cenotaph and its symbolism for the families left behind; and post-war battlefield pilgrimages. Van Emden’s research is impeccable and draws on a wide range of sources to convey the stories he is telling. Given that many of these sources are not in the public domain this highlights the depth of his research. The book is superbly illustrated, perhaps the most poignant image that of the message left by a daughter on her first visit to the area in which her father died: “Thank you for five years of real happiness – I’ve missed you all my life”. Another photo shows a mother at her son’s grave shortly after the war, the grief clearly etched on her weary face. As the centenary draws ever closer this is a timely reminder of the impact that the war had on families, communities, and the nation as a whole. I look forward to seeing what subject he turns his attention to next.